Okay, I stressed over what to name it after I posted a picture on Instagram. Looks so yummy, right? Best thing is, it is so easy to make. And perfect for warm summers. Use as a before or after workout snack, or just because you’re eat-ish and want something tasty. I will probably say this with most recipes I post: but snack time is always a challenge for diabetics and weight watchers. I am both. So I trawl the internet to find easy recipes I can make…easy being the operative word. However, no matter how delicious some photos look, the process is always a bit cumbersome, or the ingredients are out of reach. I invariably end up tweaking the recipe and making my own version. I mean, a lazy version which works. I am clever enough to ensure that it meets my stringent requirements. 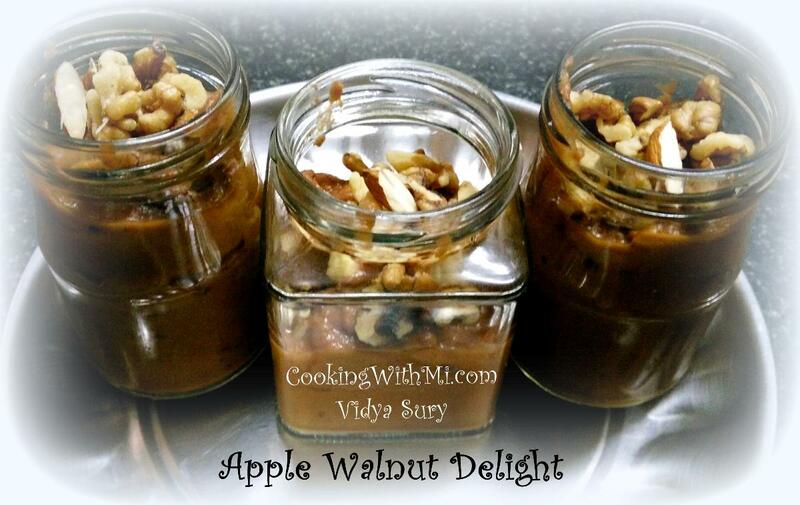 And thus was the Apple walnut delight born. 1. Collect mason jars. Mason jars sound posh, no? I mean every medium sized jam bottle or honey bottle or that dessert-you-splurged-on-bottle. 2. Buy apples. Any type will do. Or pears. Works great. About 5-6 apples for the five jars you see in the picture. 3. You’ll need chopped nuts. No, not those. I mean almonds, walnuts, sunflower seeds, ground flax seed – all these work. Or even mixed chopped nuts. Walnut pieces are more affordable than the whole ones. Core the apple and cut in cubes. No no–don’t remove the skin! That’s where valuable nutrition hides! Add a batch into your blender/grinder. Drizzle with half a tsp of cinnamon powder. Add half a spoon of vanilla essence. If you plan to add ACV, now is the time. Grind it to a pulp. If necessary, add a little milk or water to help it. Now pour pulp into jar. What? we’re almost done! Bury a date or two in each jar. Dress with nuts on top. Close and chill in fridge for a grab and go snack. You have fruit for fiber and taste, and nuts for protein, dates for iron and all the other benefits. You can store it in your fridge for a max of 3 days. Not more than that. Don’t get alarmed when the top layer is darker–apples do change color. You can just add the dates as they are in each jar, or grind with the apple. I prefer to treasure hunt them in the jar. You can layer the nuts and apple pulp. It is really nice. Apple cider vinegar is optional. Try adding a spoon of lemon juice. Yum. The vanilla essence is optional. Add it or leave it. Allergic to nuts? Hmm. Dress your apple pulp with slices of banana. You can dress it with whipped cream. But don’t blame me later! You can do this with pears and apples. Apples somehow taste better. You can blend apple and banana together. Don’t ask me to clean the blender! If you’re having kids over, what a fabulous treat this makes when you drizzle some chocolate on top! Or even a scoop of ice-cream! If you have points to add, let me know and I’ll include them here. Thank you. This sounds delicious. How long do you think it will stay in the fridge? And won’t the apple pulp turn brown? Ya! That’s why I mentioned not more than 3 days. The top layer will change color. It is delicious, Tulika. And if you layer the apple and nuts, the nuts soak and are even better! Thank you for coming by!